To remain successful in this business, it's vital that you keep up to date on the latest technological advancements when it comes to transmissions. Today, we're taking a look at some newer transmission technologies as well as some emerging advancements on the horizon. So sit back, buckle up, and take notes! Remote oil pumps, better known as off-axis oil pumps, are shifting the main driving components of today's vehicles. What this means is that the oil pump is no longer in line with the main driving components into the transmission and typically would be driven by a chain or gear from the main driving components. Off-axis oil pumps allow for a shorter overall transmission design which lets the automotive manufacturers utilize it in a smaller space. Also known as a squashed turbine torque converter, the hyper elliptical torque converter is thinner than past torque converters so that it will take up less room, making it a better overall design for smaller applications. In an article for How Stuff Works, Karim Nice explained the basics, "Just like manual transmission cars, cars with automatic transmissions need a way to let the engine turn while the wheels and gears in the transmission come to a stop. Manual transmission cars use a clutch, which completely disconnects the engine from the transmission. 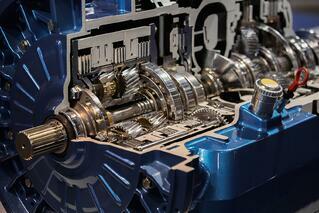 Automatic transmission cars use a torque converter. A torque converter is a type of fluid coupling, which allows the engine to spin somewhat independently of the transmission." The "hyper-elliptical" oval cross-section design helps to reduce the thickness of the torque converter, reducing the space it needs and keeping the overall width of the engine and transmission as narrow as possible. This is a big advantage when it comes to packaging. State-of-the-art dimensions allow for spacious packaging and enhances the overall potential safety design opportunities. Transmissions which have the computer, solenoids and sensors included in them are still relatively new. A TEHCM unit basically combines the functions of the transmission control module, the valve body solenoids and pressure and temperature switches into one unit. The terms "TEHCM" [transmission electro-hydraulic control module] and "mechatronic" are two terms that are used to describe this scenario. TEHCM is used by domestic manufacturers and mechatronic is used by European manufacturers. Each year, more and more manufacturers are using TEHCM technology to consolidate functions. Thus there is an ever-growing demand for replacement TEHCM units. GM has released a 9-speed that combines the first selectable one-way clutch in its 9T50 front wheel drive automatic transmission. This one-way clutch is the first to let a component rotate freely one way, but lock in the opposite direction, similar to a traditional one-way clutch, but able to lock in both directions when needed. "This patented selectable one-way clutch is a strut-based, mechanical clutching mechanism that helps improve fuel economy by way of reduced drag torque, lowered mass and improved packaging," reported Means Industries. Driven by global demands for improved fuel economy and reduced emissions, significant improvements have also been made to overall fuel quality. New and emerging fluids run lighter weights, offer better lubrication and contain specific friction modifiers along with other enhancements. Knowing what's coming in the future can only help you better prepare yourself, your technicians, and your overall shop efficiency and productivity for the ever-changing automotive industry. We want to know what you're most excited about or what you'd like to see evolve in the world of transmissions. Reach out to us on any of our social media pages.